I'm Matt.C, and I made the ridiculous Flash game you see above. Enjoy! If any of you are (un)lucky to have seen the original Magenta Kong arcade cabinet back in the early eighties, you'll probably remember the hideously garish banner art on the front and sides, and if you were especially lucky, you'll have been around when the screen used to smoke (and the smell) after it had been on for more than a few hours. Addendum (2008-09-02 22:55): Watch out, dialup users! The manual photograph is quite large: ~900k. Great effort and a great result. My hat goes off to you, sir! Think of all the things you could have done with the time you wasted on that. Not sure about the Ctrl to jump and A to move left, and D to move right. I can save as a bookmark AND select all whilst jumping! Hoe did you make the sounds? I don't have any sound. Does anyone else have this problem? Sound works for other programs, so it's not like I have my volume muted or anything stupid like that. Addendum (2008-09-04 23:51): Update: it's fixed now. There were too many Flash-based advertisements in other browser tabs. Closing them solved the problem. I can't get the game to start, pressing 1 has no effect even when the applet window is focused. Pressing P makes the "Pause" message come up but that's pretty much just an insult when the game hasn't even started yet. Tried regular 1 and numeric keypad 1, but no joy. Starting to think it's just a title screen mock...! This is awesome, and it's ball-crushingly hard just like the original DK. Makes me want to watch that movie again. This is awesome. I haven't played with Actionscript since college. Wish I could get motivated to do things like this. Still can't get this to work although if I press 3 on the title screen I get 9999 points and asked to enter a name. I win! Awesome! But is there a kill screen at the end? WASD is extremely annoying for non QWERTY users . Why not use the arrow keys ? Ok, that is so awesome, and it's so impressive that you spent the time recreating the game in such detail. 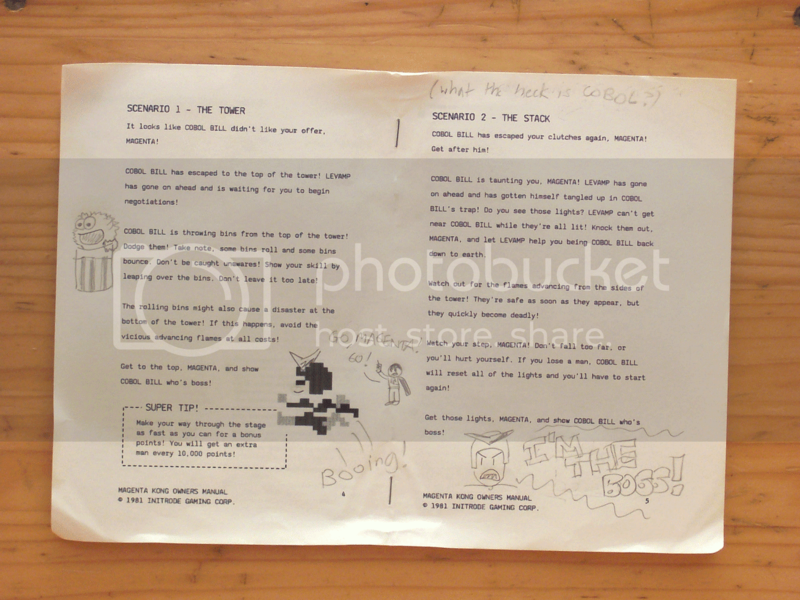 And the manual is sheer genius -- everyone must look at that now. If you jump over two bins at once, you get 300 points -- not two separate 100 point things. I think 3 bins was 500. Seriously though, you are a genius. Let me know if you need someone to have your babies. There are WAY more barrels in this than in the original, and they're often spaced too close together to have any possibility of clearing them. Also, where's the hammer? Anyway. Better this than an actual MFD "comic" strip. Hooray! That's the exact reason I added WASD, just in case your browser is strange. No hammer! Sick of it, I am, sir! I think Magenta doesn't need no hammers. If he so chose, he could use his phenomenal upper body strength to crush those bins into dust. He'd more likely try to get somebody else to it (and they'd get badly hurt). Not exactly. I was going to make it that if you got 1ST place and typed in your name as FRIST, a gigantic blocky Cobol Bill fill the screen and laugh at you with a speech synthesized 'HA HA HA HA HA', but I thought that might be a bit too creepy. - There's a pounding sound when Cobol Bill jumps at the top of the screen at the beginning of the game - There's a sound that Magenta makes whenever he jumps that is missing - If you jump over two bins at once, you get 300 points -- not two separate 100 point things. I think 3 bins was 500. Really? What operating system are you using? I've tested it in a couple of different Firefox 2s and 3s (all under Windows, however) and it works fine. This game has the wrong name. The game it's parodying wasn't called "Mario Kong." Cobol Bill is the bad guy, so it should be called "Cobol Kong." By reading and following instructions, dummy! Works like a charm here. Be sure to click on the game applet to give it focus or it will ignore your keystrokes." It don't work. I tried Firefox and that new fancy-dancy Chrome browser, and no-go. Or am I being punked? Ok I did some more testing. The non-working browsers all have the Flash 9.0 r45 plugin installed. I'm not sure what version of Flash is in IE, but I wager it's the same. All this sums up to: WTF? 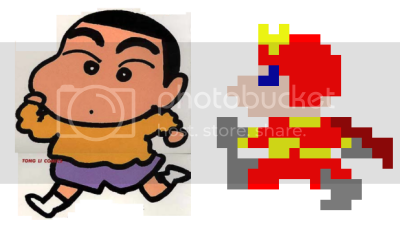 Is it just me or does the little runner guy I keep getting killed look like shin-chan? In FF3, pressing 1 to start works fine for me. I somehow got like 2000 points from a single jump over a barrel. When I got the high score, I had to use the cursor keys and control; WASD and K suddenly stopped working. Doesn't work here either. Though I've got some hilariously messed up results from button-mashing; from flashing 'paused' at me over the top of a credits screen, to a garbage highscore-table (I think) over a garbled intro screen... this game's fun. Having played the original, back in the day, I was quite impressed by the accuracy (and preserved fun) of this remake! Playing it just now, I made it to 125 m before I was frustrated by the dreaded triple-barrel. ...does anyone remember the Atari version? In the '2nd' stages, you had to walk over the junctions instead of jumping. ... well, that, and it looked like crap in comparison to the arcade game, but you could play it at home! How in the world did you manage to create a browser-specific Flash applet? I tried this in IE, Safari, Opera, and a couple of Gecko-based browsers, and it consistently fails to work in anything other than Internet Explorer. In the other browsers, it ignores any keypresses other than P (Pause) and 3 (see below). Even when running under IE, it seems to have some issues; in particular, pressing 3 during gameplay causes a "Name Registration" screen to come up superimposed over the game, with there being no obvious way to get rid of it. Another weirdness: I notice that the cursor keys work in addition to the WASD keys, but they also scroll the browser page at the same time. That's weird; I'm consistently getting this behavior on two different computers. I'd suspect a Flash version compatibility issue, but then why is it working in IE? And it's not just me; there are other people making the same complaints in the comments. What operating systems are you two running Firefox and Opera under? Both of the computers I tried this on were running WinXP SP2.